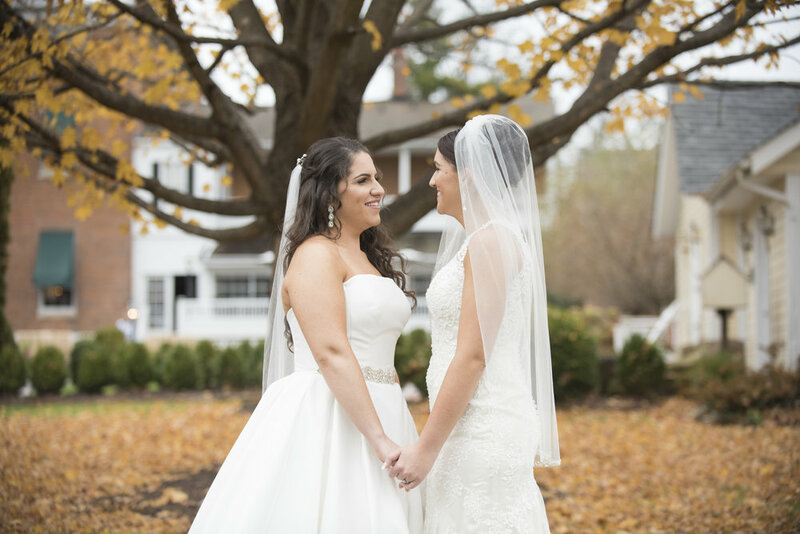 In the fall time, Erica and Emily had their dream wedding at Antrim 1844, a romantic venue in Taneytown, MD. The Antrim 1844 is a beautiful 24-acre estate historical mansion that has so many stunning spots to photograph. All the colorful patterned wallpaper walls, beautiful antique vintage pieces of furniture, the stunning manicured lawns and gardens. Everything is just breathtaking! Erica and Emily’s beautiful fall time wedding at the beautiful historic Antrim 1844 is one that I will always remember. Rooted in family ties, great friendships and glowing love, this wedding was one that was filled with so much joy and feelings. They spent the morning getting ready with their closest friends in the Antrims stunning historic hotel. They shared a private first look in the garden together in the afternoon on their big day. I love capturing first looks. The moment when they turned around and faced each other was so magical. Mother Nature had a sneak surprise with some rain (which magically held off until the VERY end of their ceremony), which turned out to be totally okay, because we got some AMAZING night rain shots! Thank you Erica & Emily for the kind words about working with you two!